The weather is getting warmer, which means your lawn will be greening up soon. Some things to look out for with warming conditions are turf diseases. B&A has fungicides that can help put the fungus into remission, but please keep in mind, it will not completely eradicate the fungus. Below are a few of the most common diseases that we deal with every year. Brown/Large patch appears as circular patches, ranging from a few inches to several feet in diameter. The infected leaves first appear water soaked and dark, eventually drying, withering, and turning dark brown. A dark “smoke ring” often surrounds the outer margins of the diseased area when humidity is high and disease is actively growing. 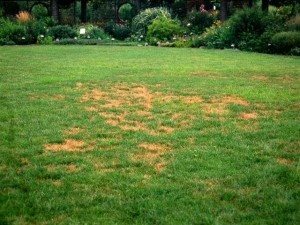 Leaves in the blighted area are usually killed, and the disease can rapidly kill large areas of turfgrass in short periods of time under conducive conditions. Look for dark, water soaked looking grass turning into brown circular areas. Blades may have irregular ash gray lesions with a dark brown margin running along one side. Brown patch survives as an organism that feeds on dead organic matter in the thatch, but when soil temperatures rise above 60° F (15-20° C), the fungus will begin to grow. While growing in a circular pattern, the fungus will begin to infect turfgrass foliage when air temperatures are above 80° F (28-30° C) and when nighttime temperatures are in the 70’s (21-26° C) with high humidity. To manage brown patch, water deeply but infrequently, mow high, remove excess thatch, and improve aeration and drainage.